The international workshop War & Languages. 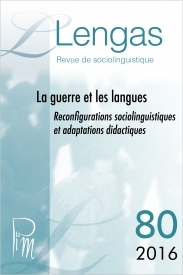 Sociolinguistic settings and educative challenges organized by the EA-739 Dipralang laboratory (Montpellier 3 University, France), the 25th of November 2016 provides the collection of paper herein. The scope of this meeting was to revisit the interconnection between war (intended as armed conflict between national states, or civil war) and languages. These contributions aim at providing an array of case studies and theoretical perspectives about how languages can be converted into practical and ideological tools in situations of conflict: how does war change curricula in education, teaching methods and practices (e.g. in schoolbooks and teaching materials), and even the drive for learning a language in individuals and groups of learners? Beyond these educative and sociolinguistic issues, this volume also addresses more widely the three basic parameters involved in power shift: political power, language empowerment or disempowerment, and - last but not least - thepower of words.